Q: I got the error message while using Rep2excel. How to fix it. Error [M:RBC] :Unable to access Microsoft Excel runtime.More info: Run Rep2excel and Excel as SYSTEM. Runtime exception[RBC][OTEFXL5 (STEP: RB_Excel2000_Loop_Start_AddWorkBook)]:Microsoft Excel cannot open or save any more documents because there is not enough available memory or disk space. ? To make more memory available, close workbooks or programs you no longer need. ? To free disk space, delete files you no longer need from the disk you are saving to. Click Start, click Run, and then type DCOMCNFG (Tip: You can also open the Command Prompt, and then type DCOMCNFG). Select the Microsoft Excel (Path: Console Root \ Component Services \ Computers \ My Computer \ DCOM Config \ Microsoft Excel Application), Right Click Properties to open the property dialog box for this application. Click the Identity tab. Verify that The Launching User is selected. Please select "This user",and the fill in the user name and password. The user specify the user account that is used to run the excel application. However, if you start the web server as SYSTEM, you can specify another user that support interactive logon. 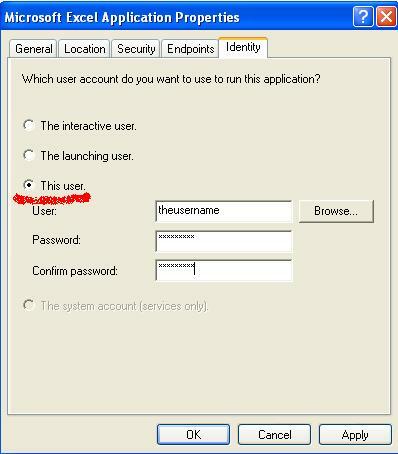 In other words, you can logon to desktop with the user account. We strongly suggest you to choose user with administrator privilege, for example the Administrator account. If you choose common user, you need setup more permissions.